Eric XIV (Swedish: Erik XIV; 13 December 1533 – 26 February 1577) was King of Sweden from 1560 until he was deposed in 1568. Eric XIV was the eldest son of Gustav I (1496–1560) and Catherine of Saxe-Lauenburg (1513–35). He was also ruler of Estonia, after its conquest by Sweden in 1561. Eric XIV by Domenicus Verwilt. While he has been regarded as intelligent and artistically skilled, as well as politically ambitious, early in his reign he showed signs of mental instability, a condition that eventually led to insanity. Some scholars claim that his illness began early during his reign, while others believe that it first manifested with the Sture Murders. Eric, having been deposed and imprisoned, was most likely murdered. An examination of his remains in 1958 confirmed that he probably died of arsenic poisoning. Eric XIV was born at Tre Kronor castle, at 9 o'clock on the morning of 13 December 1533. Before the age of two, he lost his mother. In 1536, his father, Gustav Vasa, married Margaret Leijonhufvud (1516–51), a Swedish noblewoman. Eric's first teacher was the learned German Georg Norman, whose services were shortly thereafter needed elsewhere within the Swedish state. He was replaced by French Calvinist Dionysius Beurraeus (1500–67). Dionysius taught both Eric and his brother John, and seems to have been appreciated by both. Eric was very successful in foreign languages and mathematics. He was also an informed historian, a good writer and familiar with astrology. When Eric started to appear in public, he was referred to as "chosen king" (Swedish: utvald konung) and after the meeting of parliament in Stockholm in 1560, he received the title of "hereditary king" (Swedish: arvkonung). In 1557, Eric was assigned the fiefdoms of Kalmar, Kronoberg and Öland. He took up residence in the city of Kalmar. Against his father's wishes, Eric entered into marriage negotiations with the future Queen Elizabeth I of England and pursued her for several years. Tensions between Eric and his father grew. Eric also made unsuccessful marriage proposals to, among others, Mary, Queen of Scots (1542–87), Renata of Lorraine (1544–1602), Anna of Saxony (1544–77) and Christine of Hesse (1543–1604). He was crowned as Eric XIV, but was not necessarily the 14th king of Sweden named Eric. He and his brother Charles IX (1604–11) adopted regnal numbers according to Johannes Magnus's partly fictitious history of Sweden. There had, however, been at least six earlier Swedish kings with the name of Eric, as well as pretenders about whom very little is known. In domestic politics, Eric's ambitions were strongly opposed by the Swedish nobility, including his half-brother, later John III of Sweden (1537–92). John was the Duke of Finland and was married to a Polish princess, which made him friendly with Poland. John pursued an expansionist policy in Livonia (now Estonia, Latvia, and Lithuania) which led to contention between the brothers. In 1563, John was seized and tried for high treason by Eric's order. Unlike his father, who had been satisfied with ruling an independent state, Eric tried to expand his influence in the Baltic region and in Estonia, beginning the process that resulted in Sweden becoming a great power in the 17th century. This expansionism resulted in a clash with his cousin, Frederick II of Denmark (1534–88). Most of Eric XIV's reign was then dominated by the Livonian War and the Scandinavian Seven Years' War against Denmark (1563–70), during which he successfully repelled most Danish attempts at conquest, but was unable to keep his own acquisitions. From 1563 onwards, his insanity became pronounced; his rule became even more arbitrary and marked by violence. In 1567, suspicious of high treason, he killed several members of the Sture family (Sture Murders), Eric himself stabbing Nils Svantesson Sture. The King probably thought of the killing as an execution rather than murder. After the Sture homicides, John was imprisoned and Eric's conflict with the nobility came to its climax. In the fall of 1568, the dukes and the nobles rebelled, and Eric was dethroned. He was then imprisoned by Duke John, who took power. Eric's most trusted counsellor, Jöran Persson (1530–68), took much of the blame for the actions directed against the nobility during Eric XIV's reign and was executed shortly after John III ascended to the throne. Eric XIV was held as a prisoner in many different castles in both Sweden and Finland. He died in prison in Örbyhus Castle: according to a tradition starting with Johannes Messenius, his final meal was a poisoned bowl of pea soup. 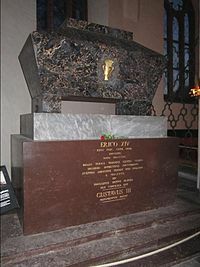 A document signed by his brother, John III of Sweden, and a nobleman, Bengt Bengtsson Gylta (1514–74), gave Eric's guards in his last prison authorization to poison him if anyone tried to release him. His body was later exhumed and modern forensic analysis revealed evidence of lethal arsenic poisoning. Karin Månsdotter, Eric XIV and Jöran Persson, in Georg von Rosen's painting of 1871. Lucretia Eriksdotter (1564–after 1574) died young. An unnamed child, died April 1565. Sigrid (1566–1633; born before the marriage), lady-in-waiting, wife of two noblemen. The life of Eric XIV is the subject of an 1899 play by Swedish playwright August Strindberg (1849–1912). The love story of Eric XIV and Karin Månsdotter is the subject of a 1942 historical novel Karin Månsdotter by Mika Waltari. "Eric XIV." . The American Cyclopædia. 1879.